I think I have finally cracked and become a full-on horse-hippy. Barefoot horse – check. Rope halter – check. Long flowing hair – oh. wait. Seriously though, a magic morning. I intended to ride Aero in the arena, doing bendy stuff and practicing for our Interdressage test this month. But after last nights torrential downpour, the arena was an unpleasant mix of stony, gluey and slippery. Stuff it, I said, we’ll go for a hack. We were in the woods when I realised I was riding in the rope halter! Ah well, I thought, he seems super-relaxed and happy. And so it was. 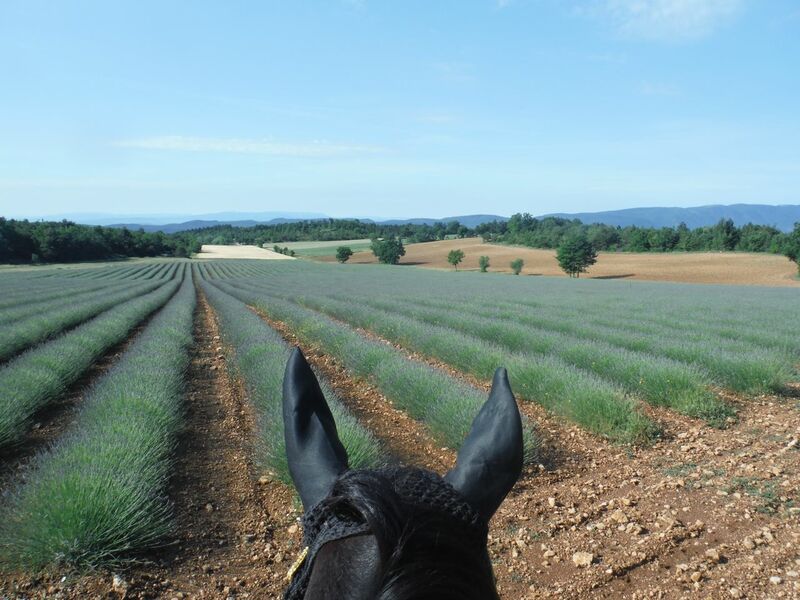 Both of us super-relaxed and happy through the woods and the lavender fields, even passing a ferocious flock of bell-wielding sheep without a first glance, never mind a second one! Today, I really wanted to ride. 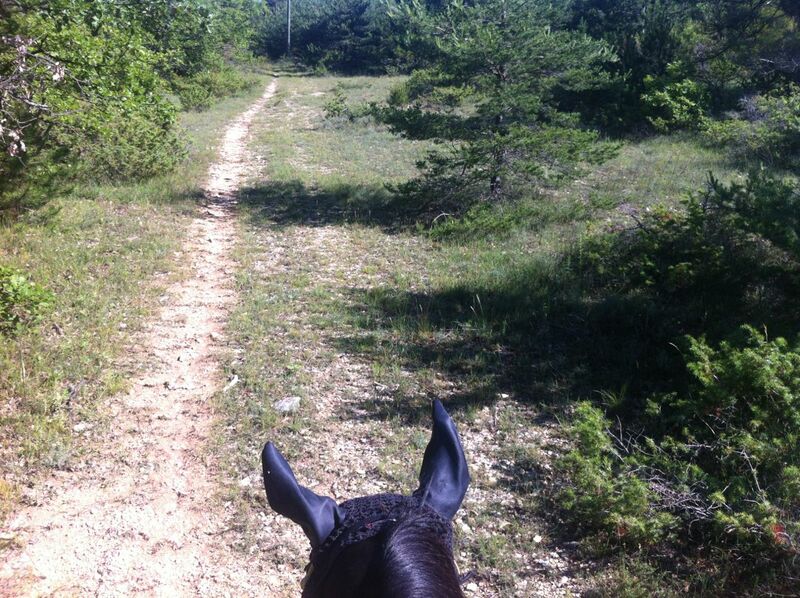 The arena is still unusable, so I decided I would go for a hack through the woods. Flurry or Aero? I wondered. Both, maybe? Then I decided to take Aero alone. But I decided not to use a bridle. Why am I doing this? I vowed not to beat myself up over using a bridle when hacking out! I’m old and set in my ways and I need the reassurance of a bit! Why? Because I KNOW that Aero is happier without a bit – he’s much softer and more relaxed whenever I ride him in the arena. I’ve said at least a dozen times that he feels exactly the same when I’m riding in a halter as he does when I ride in a bridle. Truth be told, he’s BETTER in the rope halter. So I girded my loins and headed out through the woods on a one-hour loop. Actually, there was no girding of loins involved. I was totally relaxed about it, which is weird because I am a Serious Wimp. Really. Anyone of my horsey friends in Cork will confirm this. I needn’t have worried. He was interested, happy, never scary. I’ll continue to use the halter for ‘local’ rides. When we next go further afield – well, I’ll see. Never say never. Am I likely to start riding Flurry out in a halter? Actually, no. Flurry has a naughty, opportunistic streak that Aero does not possess. I’m in no hurry to experiment with him! That video!!! Aero is a gentleman! I love the scenery. I don’t think you’re mental. You’re having funnnnn!!!! I’m still asking myself am I brave or mental! l say whatever works and makes both of you happy. I don’t ride anyone in a rope halter because I’m not sure I can trust them or me without a bit and bridle. I can be a bit on the wimpy side when hacking out truth be told. 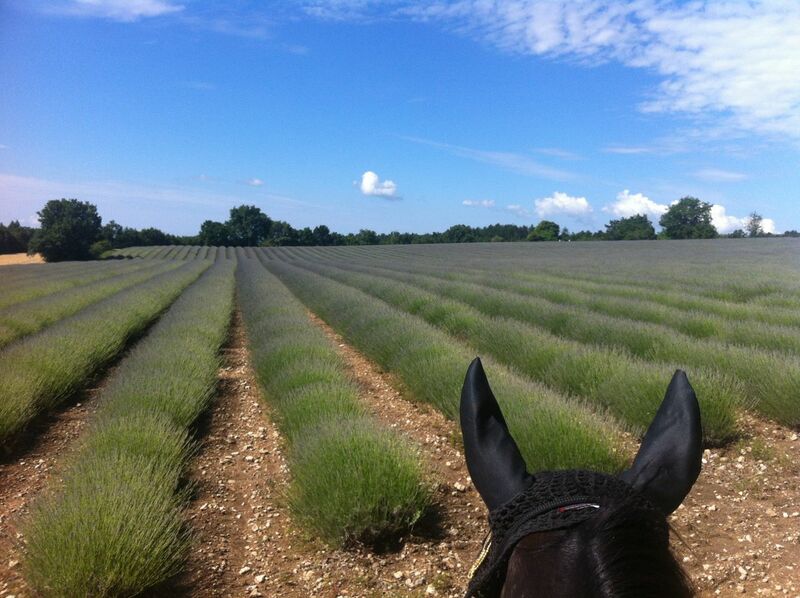 Gorgeous lavender fields. I’d love to ride there! I know what you mean – I don’t know that I would ever trust Flurry, I just know he has a roguish side! 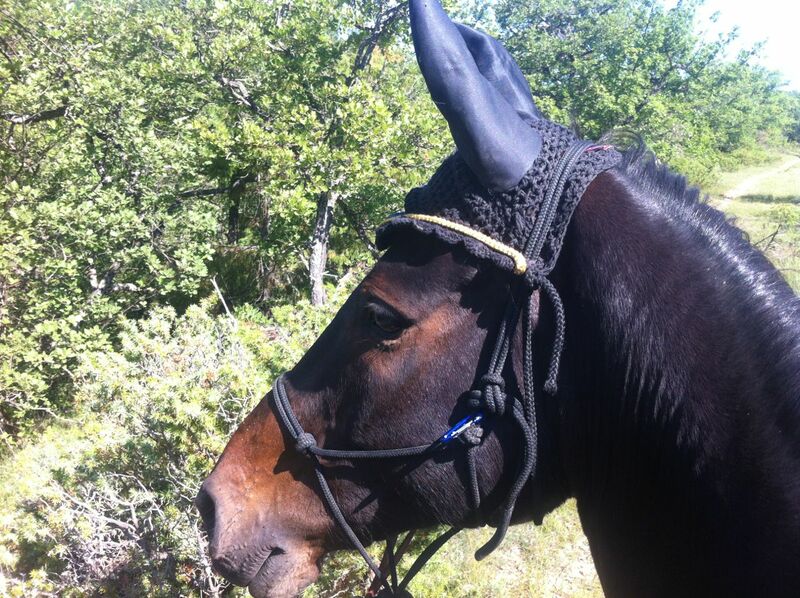 Very cool that you can ride Aero on the trail in a halter! Lucy can’t handle the trail at all. After a year, she can sort of hack around on the property. Sort of. Do you remember how scared Aero was when we arrived here? No-one ever thought I would end up riding him in a halter, least of all me! It took a year before he began to feel really confident in the woods and it’s taken another year and a half for me to A. discover I can ride him in a halter and B. trust him enough to ride out with it. Maybe Lucy will learn to appreciate the great outdoors eventually, too.